We drive 2015 Nissan Leaf, an Electric Vehicle or EV. Both before and after we leased the car, I carefully researched the kinds of EVs available and what would be best for us. I learned a lot from online forums and blogs and you can too. Granted, I am a nerd and the research was a fun diversion from my day job, writing a lengthy and time-consuming book. Nevertheless, my research informed our decision to lease a Nissan Leaf, for example, rather than buying one. Moreover, my research gave us the information we needed to take full advantage of the car’s capabilities, how to get around its limitations, and where to go for more information when we needed it. I found two principle sources online: an electronic forum, and blog posts by EV pioneers. In none of my research did I use or rely on promotional materials from manufacturers. I sought out independent sources. There are electronic forums for most cars today. There is at least one for Toyota’s Prius, for example, and possibly more. There are forums for each electric car brand, but the grand daddy of EV forums is www.mynissanleaf.com. With 150,000 vehicles on the road, Nissan has a broader customer base than any other EV manufacturer. Mynissanleaf is a lively forum where EV pioneers driving the Nissan Leaf post their experience—good and bad. The discussion can get quite heated or go off on wild tangents, but moderators are there to step in when necessary. There are other Nissan Leaf forums, but mynissanleaf is the one I use. With guys like Tony Williams in San Diego populating the mynissanleaf forum, this is my go to place for how to change a windshield wiper or plan a road trip. Williams, for example, is the producer of the Nissan Leaf Range Chart, a useful tool for calculating how far you can drive a Leaf on a charge. He’s a founding member of the 100-mile club (Nissan Leafs have an official range of 84 miles. ), and pioneered BC2BC, Mexico to Canada, rally, all 1,500 miles of it in an EV. Williams has more than 9,400 posts on the board, informative all. Only Dave Laur in Olympia, Washington has more with 10,000 posts. Laur has a terrific blog of his own at http://daveinolywa.blogspot.com/. He’s a good writer and a nerd as well. As an old timer who drives a Leaf for work, he writes from experience. I’ve learned a lot from his blog. When tackling a tricky question, it’s sometimes helpful to visit the other message boards, such as the Chevy Volt forum, or the Tesla Motors Club. There are some very sharp people on the Tesla board, reflecting the sophistication of their clientele. Similar to the other boards, I found some useful info on EVSEs (Electric Vehicle Supply Equipment) and compatibility issues on the Tesla Motors Club that I didn’t find elsewhere. To keep track of the industry and follow what’s out there now and what’s coming I peruse a few online zines: Inside EVs, EV Obsession, Green Car Reports, and Transport Evolved. I am partial to Transport Evolved because of its independent, EV driving editor, Nikki Gordon-Bloomfield. Another useful site is PluginCars by Brad Berman. These are some of the sources I use to try and stay abreast of EV developments. Today, I can’t imagine buying or leasing a car—any car—without researching them online first. 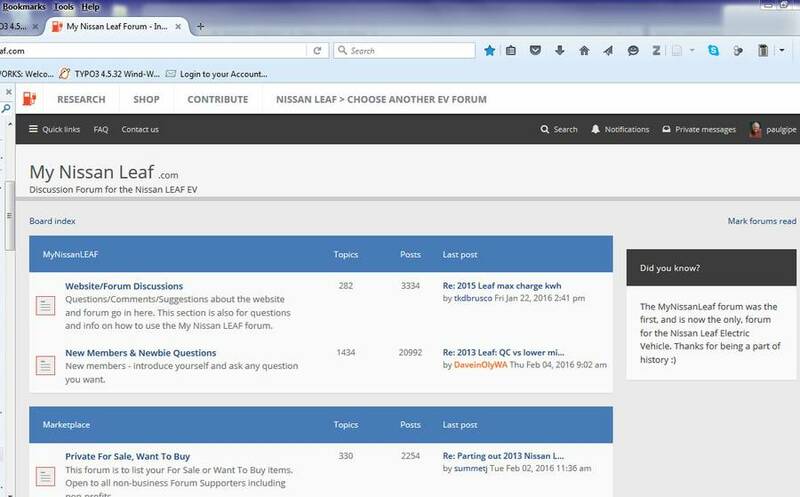 In fact, the mynissanleaf forum has a section devoted to deals for leasing and another section devoted to deals for buying a Leaf. It’s all there in black and white what other people are paying for a car. It was the detailed information that was available about leasing deals in California from the mynissanleaf forum that led us to lease our car form a Nissan dealer hundreds of miles away. See Buying an Electric Vehicle Mail Order: Or Why we bought our Leaf from Petaluma and Not Bakersfield. If you’re interested in buying or leasing an EV or simply just curious about what they can do, visit one of the forums, follow a blog you like such as Dave Laur’s, or peruse one of the many online zines that focus on EVs. Join the revolution.